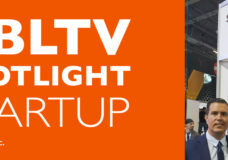 Home » Electronics » Automotive » YBLTV Spotlight Startup: TICKEY Mobile Solutions LTD.
YBLTV Spotlight Startup: TICKEY Mobile Solutions LTD., Konstantin Nikolov, Business Development. CTIA Super Mobility 2016. TICKEY Mobile Solutions LTD.: TICKEY is the only mobile application with which the passengers can buy tickets for public transport with just one click on their smartphones. 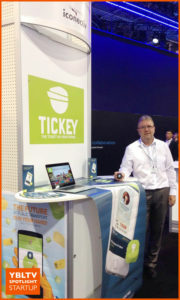 TICKEY provides convenience to the passengers, saves them time and money. The app works perfectly with all existing public transport systems, vehicles and scenarios – buses, trains, trams, metro fare gates, ferries, etc. According to Forbes, TICKEY is an innovative smart ticketing system that can be considered as “UBER for public transport.” The TICKEY platform is based on iBeacon technology and it is first solution implemented based on such technology worldwide. It uses Bluetooth LE proximity sensors, which are implemented in every public transport vehicle. The sensors allow the platform to know where the passenger is and to propose the best price for the journey. The passenger makes just one click on his smartphone to confirm the ride and authorize the payment for it. TICKEY is available for Android and iOS. TICKEY Mobile Solutions LTD.: The inspiration of creating TICKEY came from everyday routine that most of us experience everyday. We just want to make our days easier by using something that we use all the time – our phones. The biggest investment of buying a ticket for the public transport is your device and it’s already done. After that you only save time and money. In 2014 we decided tо make a change in one of the most common “rituals” and to bring more convenient methods for traveling around the city. We all use our smartphones for everything – why not for paying our public transport tickets too. It’s easier, it’s faster, it’s safer. We want to increase the attractiveness of public transportation and therefore its usage, by making the passenger’s journey more convenient and exiting. 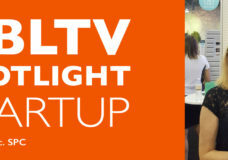 YBLTV: How did you go about starting up, did you apply for funding or did you self-fund the project? If so, where did you secure funding from? TICKEY Mobile Solutions LTD.: The journey of TICKEY starts from StartUp Weekend Sofia Mobile 2014, where the company wins 3-rd place and therefore is invited to participate in the Pre-Accelerator entrepreneurship program of Start It Smart. There, for 54 hours Nikolay Vassilev /CTO/, Dimiter Dimitrov /CEO/ and Stavri Georgiev /Designer/ create TICKEY version 1.0 with which you can buy public transport tickets with just one click. Later that same year TICKEY becomes part of the eight badge of the accelerator and venture capital fund Eleven and receives financial investment of 25 000 euro. TICKEY Mobile Solutions LTD.: We got a lot of help from all of the startup environment in Bulgaria, especially from Pre-Accelerator entrepreneurship program of Start It Smart and from the accelerator and venture capital fund Eleven. TICKEY enjoys the support of the government, big businesses, projects and organizations, which are important for Bulgaria – like UniCredit Bulbank, TechPark Sofia, MasterCard, etc. TICKEY Mobile Solutions LTD.: Our biggest challenge was to make contact with the big administrative structures like mayors, governments, transport authorities. They are hard to find, and there are a lot of procedures that need to be done to reach them. But with the right campaigns and events – nothing is impossible! YBLTV: What is your next big step? TICKEY Mobile Solutions LTD.: First, our next targets are the biggest cities in Europe. After that, the biggest cities in North and South America and Australia. Actually, we already negotiate with some of them. TICKEY Mobile Solutions LTD.: There are a lot of good things about being a startup, like being a fresh new company with a lot of innovative ideas. There is a great startup environment, a lot of people that support us and many opportunities for business development and networking. The only challenging thing some times is the money, but this not stop us from making our dream come true. We are team formed by 9 people, who are fully committed to making the change in the public transport system. TICKEY Mobile Solutions LTD.: What makes TICKEY unique is its technology. Unlike its competitors, TICKEY doesn’t need personal validation every time you use the app. It needs only a one-time input bank card which is secured by PayPal. TICKEY doesn’t require scanning any kinds of codes. You don’t need to choose your destination, kind of public transport or price. TICKEY uses proximity sensors, which can be implemented in every type of vehicle, stations or gates. These Bluetooth sensors, called iBeacons, recognize exactly where you are, the type of vehicle, the price of the journey. TICKEY sends you a notification which asks you if you want to buy a ticket for this trip. All you need to do is — a single tap. Yes, just one tap and you already have a valid ticket for the exact vehicle you are in. It’s that simple! TICKEY Mobile Solutions LTD.: Our customers are transport authorities, cities, whole countries. Every customer is important for us and we will be extremely happy if we can improve the transport system of any city in the world. Our dream is for every person in the world to travel with public transport with just one tap on his or her phone, no matter where they are. YBLTV: How do you see the mobile landscape evolving from 2016 and beyond? TICKEY Mobile Solutions LTD.: Everything is changing so fast and we are glad to see that. Mobiles will become a larger part of human life. People will continue trusting and allowing mobile to help them out in everyday life. Personalization and customization will become prevalent. We see more of a shift towards wearable smart devices. People will become more conscious about security on mobile and data that they share online. Connect with TICKEY Mobile Solutions LTD. Owner name: TICKEY Mobile Solutions LTD.